Poker is a game. So is corporate strategy, in some ways at least. Of course you can’t equal the two. But you can compare them. I think there are some interesting thoughts by looking at corporate strategy through the lens of poker. In poker as in corporate strategy, luck determines the outcome of a battle, but strategy the outcome of the game. In poker the bankroll is the total amount of money that you are able to invest into playing poker. It’s the question of how deep your pockets are in case you are loosing, because you will be loosing at times, sometimes over long stretches. When you enter a game you pay the “buy in”, which is the the total amount of money that you can lose playing that particular session (e.g. a tournament or cash table). Prepare to often lose your full buy-in. When it happens, you need to be able to afford to buy in again. And again. But once you are winning, you will be winning a multiple of your buy in, compensating for all the lost games before. The rule of thumb in poker says that your bankroll should be at least 20-40 times the buy-in for no-limit games. So, if you want to play high stakes with say a $50’000 buy in, you need to have at the very least one million dollars in cash that you are willing to invest into poker. However if you have $50’000 dollar on your bank account and you do play a $50’000 game, you are acting irresponsibly by exposing your substance to luck. Additionally, you put yourself into a stressed position: Besides psychological effects due to which you will probably play badly, others with deeper pockets will also attack you with expensive moves, that you can’t afford to counter, unless you put your whole substance into one single bet. You need to consider each session as an option where you have a high upside (the potential win) and only a limited downside (the buy in). In other words, the prize of one option is the cost of a buy in. You need to have many options in order for your portfolio to be winning overall. This is the basics of diversification. Whether it’s your own company’s money or the money of committed investors; you need to have deep enough pockets in case you need to buy another option. In poker 20-40 times the cost of one option is considered a realistic bank roll. For a business portfolio this would mean that you need to afford 20-40 different investments with a high upside each. Contrary to a fund’s portfolio, which is invested in parallel into all it’s investments (options), you may also exercise your options over time, one after the other. It may even be a bettter idea than spreading your options over too many areas (i.e. too many different types of games/markets), because you will inevitably not be equally good in all of them. It may be better to invest your money into similar strategies within the same market, one after the other, to see which one yields most. In poker, the first question you have to ask yourself is which game you are going to play and against whom. Game selection is primarily a question of individual risk preferences and skills. There are fixed limit games (where the maximum bet size is capped) and unlimited ones (where players can bet up to the total of their disposable chips, the infamous “all in” move). Playing a new game, players usually start out playing free variants with purely virtual chips known as “freerolls” or small stake games with e.g. a 5$ buy in until they are familiar with the rules and dynamics of the particular game. Table selection then is very simple: You look out for the tables with the worst players. Poker isn’t about proving you can beat the best players in the world (unless you are among them fighting for multi-million dollar prizes). Poker is very simply about earning money while having fun. To do so you definitely want to fight the easiest targets, know as “fishes”, not the hard-to-beat “sharks”. For corporate strategy this could mean trying out new product/market strategies in test or even purely virtual markets. This is pure MVP thinking. E.g. if a project can get funding on kickstarter, chances are you can also sell the product afterwards. Make substantial investments only once you are sure you can make them grow, because you have proven so with smaller investments before. What goes for table selection also goes for market selection: It is so much easier to make money if your competitors are really bad. Maybe the best markets are then not the one with the biggest pots (i.e. large and for that very reason highly competitive markets such as the US or Germany) but rather smaller countries where the pots are easier to grab (e.g. in Eastern Europe). When you enter a game, the first thing that will influence your strategy is your position: You have an absolute position, which is simply the question which players sit left and right from you. Players at the right are the ones that will make their moves just before you. They are preferably the lose and aggressive players at the table, i.e. those who bet a lot. As they are much more difficult to deal with, it’s an advantage if you know their moves before you act yourself, so you gain an information advantage over them. Then there is the relative position: Each time a new hand is dealt the “dealer button” along with the big and small blinds (the forced bets), moves one player further. If you are “sitting on the button” you will be the last one to make your call. This is a substantial advantage in terms of the information you have available to make your decision: As you know how all the other ones have behaved (i.e. betted), you can take direct advantage out of this knowledge. For instance, if all of the players before you have showed reluctant betting behaviour, a strong bet of yours might bring them to fold, even if they might have better cards than you. One obvious parallel is how you position yourself against your competitors: You should closely observe and react to the good and the aggressive players. You should at the same time try to squeeze the weak, predictable and risk-averse players (i.e. grab market shares from them). First mover or follower: Be the first, or be the best? Poker lets you feel the core advantage of a follower position: You can deal with much more information. By analyzing the first movers’ actions you can use this knowledge to your advantage. And indeed in the real world, the winners are rarely the ones who did something first, but the ones who did it best. Facebook was not the first social network, Google was not the first search engine and Apple wasn’t the first computer maker. All of them learned from earlier players… and then played their own game. Each game session for which you paid the buy-in (which you can consider as options to multiply your buy-in) is composed of many “hands”, that is individual games that are played until one (or sometimes several players) have won the game’s pot (the “profit pools” in strategy language). And within each hand, you have again to deal with many options, which is the actions you can take. If you are not familiar with poker, see the appendix at the end of this article on how the available information and the real options unfold in the course of a session of No limit Texas hold’em. If you look at a poker round as a temporal process in which the available information increases, it becomes crystal clear why “all in” moves at an early stage are usually not a good idea: You put all your assets at full risk, although you have almost no clue about how the round will turn out. In the example above, even with two aces – the best starting hand possible – your odds are still more than 2:1 against you! So better wait and nurture the pot according to your chances to win it, and if the hand turns out in your favor, you can still go all in at a later stage. If you want to succeed in poker in the long run, you need to get hold of as much information as possible and process it to estimate your current winning odds. Information is not only quantitative about the probabilities of how a hand can develop, it’s also qualitative. The latter is namely any information you can get about your competitors, such as their previous and current behaviour, their call/raise-frequency and also “tells”, i.e. unconscious behaviours that may reveal a lot. You need to add all those small pieces of qualitative information to complete the picture. Very often you will overrule the statistically correct call or bet size because of those pieces of additional information. But don’t mistake this for gambling: This is still a purely rational decision. Just because your information is incomplete, it’s absolutely crucial to do the number crunching to get the probabilities as exact as possible. Only then you can take a rational decision. Your winning probability will never be 100%, but if you don’t know how high it is, you will take bad decisions by either investing too much or not enough. And always remember that the numbers are just one side of the story; qualitative information is the other and often the much more important one. To calculate your odds of winning, you need to know what possible outcomes in the future will be beneficial to you and in what way. The actual outcomes may develop in completely different directions (say you have a pair in your hand and end up with a straight, for which the fact of having a pair is useless, as you only need one the cards). In corporate strategy, this is why the development of scenarios is so important: Not because you want to know how the future looks like, but because you need to know how it could look like and what actions you would take depending on different developments. Despite all number crunching and information processing you nevertheless need to apply your intuition in the end. There are just too many factors that cannot be nailed down however hard you try, sometimes not even qualitatively. You need to judge the total picture in your head correctly in order to make the correct call. However, without analysis, intuition is useless. And without intuition, the analysis is useless, too. Every good poker player is dealing with real options. He adjusts his bet sizes based on the probability of a certain outcome. Increasing the bet increases the upside as other players have to call him, if they want to compete. It also cleans out the competitive field as more and more players with weak hands will fold, i.e. he is raising barriers to entry. But still you’re rarely in for a sure win, however good your hand is at a particular point in time, it still remains only an option to win. In the end you may lose everything that you’ve invested. This is why it is so crucial to manage your investments wisely, to spread them over many different hands, even within one game and to manage your options correctly. At occasions, you will want or be forced to move all-in. These are exactly the moments of truth where you will see whether or not you will win the game. However, as soon as you do it, you are not able anymore to do anything: You put your fate up for luck. You may be “the winner who takes it all” or the challenger who went bust trying to beat the “big stack”. Moving “all-in” in every hand would obviously be a very dumb approach (that you see in freerolls some times). Others would slowly ripp you off, because you expose your assets way too much. But when it’s necessary, you also need to be willing to literally “bet everything on one card”. One of the prime psychological mistakes both poker players and corporate leaders make is considering sunk costs for decisions, i.e. how much you have already invested. However to calculate how much you should invest into a particular decision, the only parameters that matter are the current size of the pot (how much can you win) and the probability to actually win it. How much of your own money you have already thrown in is just plainly irrelevant. The little devil inside your head will tell you otherwise however: He tells you that because you’ve already put in so much, you should keep trying your luck. So if a game turns out unfavourable and you think your hand is weaker than your competitor’s, you just need to give up the investment immediately. The single biggest mistake in such situations is investing more money, into mere hope. In the end, it’s just a game. If you lose, you need to regain your strength, and just go for the pot again. And again. What is very essential to both poker and the corporate world is that without tactics (how you behave) and strategy (your game plan), you are destined to lose in the long run. Without tactics and strategy, poker as well as strategy and management is just gambling. On the other hand, you will be winning big money in the long run if you are doing your strategy work correctly. You need to be getting the stats right to know what would be the rationally correct action every single time, you need to have your individual tactics and strategy in place, and you need to be letting your intuition make the final calls. You should never attribute a particular win to your skills, but to coincidence. Because that’s what is: The question is not whether luck or skill was responsible for a particular win, because the world is usually too complex to judge this anyway. The real question is how you are dealing with luck (i.e. uncertainty), in the long run. Going for the quick win will always be a matter of luck. Going for the long term win will always be a matter of brains: It’s the results of a sequence of myriads of decisions that you take over time. This is the game that you can win without exposing it to luck. But you need to make the stats work for you. If your statistical probability to win is 10% and you can increase it to 12% through skilled playing, your return in the long run will be 20%! Put variance into the equation and the only thing you need is a long enough breath to realize the expected returns. If you take the long term view, the only way to improve your odds is smartness, i.e. tactics and strategy. Here, consistency is of the essence. You need to execute your play consistently over time in order to materialize wins. Obviously, if you win, someone needs to lose. 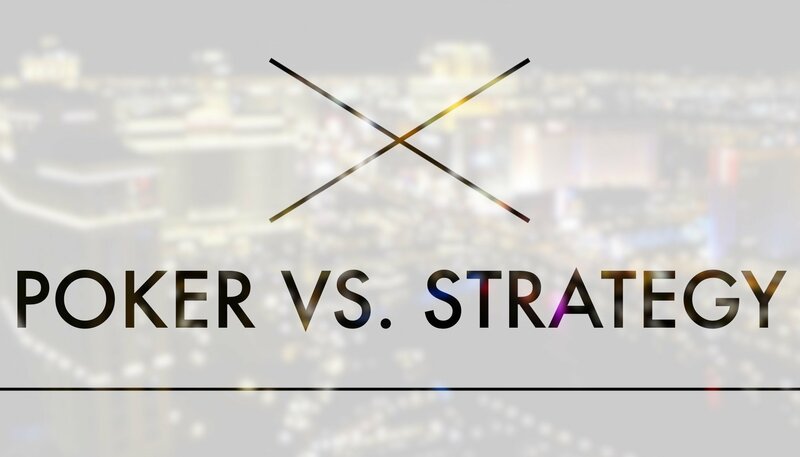 In the long run, I argue that in both poker and the real world, strategy is what makes the difference. Strategy makes winners win and the lack of it is what makes the losers lose. You won’t find this in any text book neither for corporate strategy nor for poker, but I would argue that the capacity to tolerate frustration really is the most difficult piece in both disciplines. If you lose a game, you will feel bad. You need to resist the immediate urge to “fight back”, because with such emotions you will ultimately play badly and only lose even more money. You better calm down, reflect your mistakes, and give it another try another day. Loosing phases can also last for long and if they do, frustration joins the game. You need to master negative emotions in order to win again. In poker, as in real life, who you think you really are is not nearly as important as who others think you are. Let’s take the example of aggression: If others perceive you as an aggressive player, they will fear that you might fight them in expensive and stressful confrontations. The truth is, most people do not like to fight, because it’s emotionally difficult to deal with. For that reason, aggressive players can be very successful, simply because other players will give up a hand a bit more often than statistically appropriate in order to avoid a fight. On the other hand, “tight” players can be also very successful, because every time they enter a fight, people expect they have got some serious weapon in their hand, even if they don’t. And then there is the somewhat strange phenomenon of the winner image: You get it by chance, by having one or two monster hands in a short time and winning a couple of hands in a row, which of course is luck. But if you acquired such an image, it becomes a self-fulfilling prophecy: However rational they may be, others will start to fear your hands and avoid confrontations more often than appropriate. This is funny, as your chances of getting a good hand are just the same as for all the others. And yet the psychology does a huge trick. Some unconscious believes about fate and coincidence may play a role here, too. The worst image that you can have in poker by the way, is the one of someone who is undecided. Such players are dubbed “calling stations”: It’s someone who throws his money into the game and then folds often. It’s someone who does not have the guts to claim a pot. This is a sure strategy to lose your money. Interestingly, image is not only something that is attached to you. It’s also something that is very occasional: If you are the first one to raise in a round, you take the “initiative”. People almost inevitably think that you have a good hand. If you keep up the initiative in the next betting round, that image in the heads will only strengthen. Even if your hand turns out to not be that good in subsequent betting rounds, this is the moment where a bluff may work. The really important part of poker psychology is not bluffing (over-promising), as many assume: It’s who people think you are. In corporate life, this is what you build up with a multitude of activities, such as PR, marketing, product design, marketing messages, commercial strategies, etc. Contrary to popular belief, bluffing with absolutely no good cards doesn’t work for long in poker. You might succeed once or twice, but the first time you get caught running such a bluff, people will keep calling you in the future. Bluffing without having good content actually reduces your options, because future bluffs become next to impossible. In German there is a saying: “Wer einmal lügt, dem glaubt man nicht, und wenn er auch die Wahrheit spricht” (Someone who lies once is not believed, even though he may speak the truth). In the corporate world, this is the parallel to meaningless marketing campaigns or over-promising on products in sales. People will very soon make it transparent. In poker, strategy in the narrow sense of the word (i.e. a plan for how to go forward) is not all that important. Poker is much more about the concept of tactics, i.e. the rules, values and behaviours that you apply in a consistent way in order to play your game. I personally think that for many businesses these days, in particular digital ones, this holds true as well: Tactics have become much more important than traditional long term strategies (although you need them, too). In other words, it’s about what governs your decision making. This is the very essence of tactics. Good tactics define the values and rules that allow you to take effective decisions in any given situation (e.g. your business principles, your long term vision, your mission, recruiting policies and so on). I would also add behaviours to the tactics concept; it’s the corporate equivalent of character. Real options should become the instrument of choice to manage uncertainty. In poker, it would be just plain non-sense to predict future events. Strangely though in the business world, most business planning exercises still seem to pretend to predict the future to make their long term plans. I would argue, this is just as meaningless in the corporate world as it is in poker. Poker essentially requires that you identify your options, the possible future outcomes, calculate their probability, give the options a price and make your call. Everything else is gambling. I think it would be very appropriate for corporate strategy as well to see any given situation as a portfolio of options into which you can invest a bit more to see how they turn out in the next round. As such, I would go as far as to say that the poker image actually strongly suggests to let go concepts such as net present value analysis. The underlying assumption of uncertainty decreasing the value of your investments is just plain wrong in most cases: Uncertainty usually increases the value of your investments (given that you treat them not as destiny, but as options that you are willing to let go, or re-invest into). If I would go for one single analogy of how a poker strategy would look like in the real world, I would say it is the lean management approach. This approach is essentially based on the same reflections of cheaply creating options, validating them, re-iterating, and once something works, re-investing and growing it big. That’s exactly how poker works as well. The poker analogy applies neatly to winner-take-it-all markets, namely anything that is driven by network economies. If this is the case, any no-limit poker variant simulates the possibility of gaining everything, i.e. total market dominance, by eliminating your opponents (rather than cooperating with them). In the light of a potential total win your assessment of risk automatically changes. And as poker teaches: Not only the probability side changes over time, also the psychology. Things will pick up momentum at some point, purely for psychological reasons. Poker is played against opponents. As such, you can’t apply it to products and customer relationships. But in my opinion it does simulate neatly how competitors interact with each other. It’s actually a pretty sophisticated application of game theory. The way how other players are eliminated also resembles to tender processes, where a field of competitors is narrowed down in subsequent offer (betting) rounds. In the course of a tender process the actual needs of the client become clearer so the information increases (just as you see more and more cards in the course of a betting round). Whether or not your products fit depends largely on this development. Also your boldness plays a role in the sense of how much you improve your offer (how aggressively you bet) and of course the psychology. Poker also resembles in many ways to negotiations in general (although negotiation trainers would jump off the roof over such a statement). But I experienced that the way negotiations often unfold has many parallels with poker: The uncertainty of the outcome, a power play between the parties, the building up of a “table image”, and the fact that there are several (betting) rounds where new information and new proposals come on the table. Of course, successful negotiations need compromising at some point, and poker teaches you nothing about that. So be careful with transferring the learnings nevertheless. The real world obviously has no clear set of rules. The rules themselves are part of the game and as such, they are often negotiable. In poker, your options are limited to call, raise or fold. In the real world, you have much more possible actions to take. The most notable difference is that in the real world, you can design your options in the first place and change them on the way. Poker is not a creative game, but the real world is: The more effort you put into creativeness, the more options you can create out of thin air and the better you can adapt them over time, the more likely it is for you to win. And lastly, in reality, you can engage in parallel activities/options, in poker you can’t (besides the possibility to play several online games in parallel). Essentially, in poker your options are sequential. The image therefore rather resembles to a sequence of projects or business ventures, not to the portfolios of such that you would find in most organizations. Play a round of poker. See for yourself if you can learn anything applicable for your business. And even if you can’t: Enjoy the fun! ‘Images of strategy’ is an essay in the form of a series of blog posts looking each at an analogy that has nothing to do with management and (corporate) strategy in the first place. What unites the images is that they all have highly strategic aspects. Looking at them may provide transferable ideas for corporate strategy. Taking the example of the popular no-limit Texas hold’em, you start off each hand holding only two cards out of the seven that will be there in the end. Therefore you have less than 30% of the information needed even to complete the picture of how good your own hand is (and you know very little about what your competitors have at this point). Nevertheless you have to take the decision whether or not you “play the hand”. If you play the hand, you need to decide how much money you invest into the options that the two cards you are holding provide. Let’s assume there are 10 players at the table: The probability for each player to win a hand is 10%. Now depending on how good your starting hand is, your true winning probability ranges from about 5% (a 2 and a 3 of different colors) to about 30% (two aces). But even though two aces are 6 times more likely to win over 2 and 3, it’s still possible to win the pot with a 2 and a 3. By taking your decision to bet, you will take into consideration not only the statistical odds, but also many other factors, such as the behaviour of the other players, the size of your chip stack at the table (i.e. disposable money for the project) and the strategy you are taking (e.g. even if you have two aces, making an all-in move would scare off other players and it’s not a sure win neither; you would win the hand only in less than 1 out of 3 cases). Then comes the “flop”, i.e. the next three cards of the hand. Now you dispose of significantly more information: You know now 70% of the cards of your final hand. Using them, you can again calculate your winning probability or equity in the pot, because again, you have to take the same three possible actions. Knowing how likely it is at this point of the game to win the pot in the end is again crucial to take your next decisions. Another card is laid (the “turn”) increasing the total information to 85%. You decide again whether to fold, call or increase. Only after the last card (the “river”) you dispose of the full information about your final hand strength. And again there is a betting round. Although you know all your cards, you still can only take assumptions about your competitors’, i.e. even now your information is limited. However, during the hand, the information about your competitors has also greatly increased: The way they have behaved will have revealed a lot about what they are up to. But still, only after seeing the hands of all the players still in the game you dispose of 100% of the information. But then it’s too late as at this point you have already won or lost. This entry was posted in Strategy, Management. Bookmark the permalink.